Singapore Permanent Residents can now let their mouse do the journeying, instead of having to travel down to the Immigration & Checkpoints Authority (ICA, http://www.ica.gov.sg/) Building to renew or transfer their Re-Entry Permit (REP). 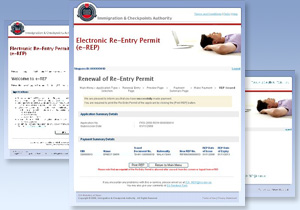 With the launch of the Electronic Re-Entry Permit service (e-REP) by ICA on 2 January 2009, these transactions can now be done online, anywhere and at anytime, within minutes. e-REP eliminates the need for Permanent Residents to turn up personally at ICA for Re-Entry Permit transactions. The REP allows Singapore Permanent Residents to retain that status while travelling abroad. e-REP not only eliminates the need for the Permanent Residents to turn up personally at ICA for REP facilities, it also streamlines the application process as applicants no longer have to submit supporting documents such as their Central Provident Fund statements and tax assessment to ICA. Generally, applications for REP facilities submitted through e-REP will be processed within one day. The e-REP system also enables Permanent Residents to perform additional functions such as checking of REP application status and enquiry of REP details for the applicants and their children. The online system is also integrated with the enhanced Immigration Automated Clearance System (eIACS), which allows eligible Permanent Residents to clear immigration checkpoints more quickly. Permanent Residents who have a Singapore identity card can now conduct immigration clearance through the automated lanes with their machine-readable passports. Prior to the launch of the e-service, the REP was issued in the form of an endorsement in the passport or as a REP card. With e-REP, ICA no longer issues REP in the form of endorsements or REP cards for all REP applications approved on or after 2 January 2009. Current REP endorsements and REP cards remain valid until their expiry date, provided they have not been cancelled or invalidated by ICA. Permanent Residents who hold valid REPs and have a SingPass account can access the e-service in order to renew or transfer their REPs. Those who do not have SingPass or whose REPs have expired will have to submit their REP applications personally at the Permanent Resident Services Centre at the ICA Building. Singapore citizens or Permanent Residents with SingPass accounts can also use e-REP to submit REP renewal applications on behalf of their spouse and children. The fee for a five-year REP remains at S$50, and is payable via credit/debit card through e-REP once the application is approved. There is no fee for the transfer of REPs.